Set back on the clifftops at Sandsend, 19th-century Raithwaite Hall was once a local shipping magnate's country pile. Now, it is owned by property and leisure group Skelwith, which has spent £30m turning it into a 45-bedroom hotel. 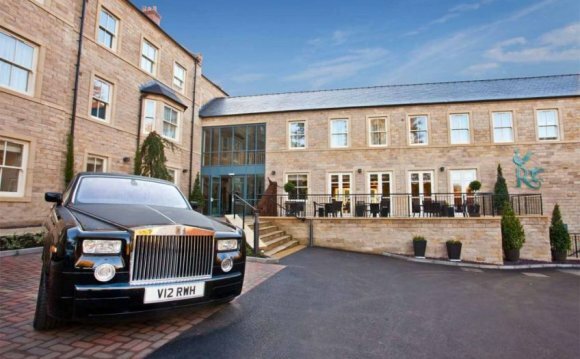 It describes itself as a "country retreat", but Raithwaite is also a spa and a wedding venue, with business conference facilities. Quaint it ain't. It is a well-oiled machine, a hospitality hub aiming – and this isn't necessarily pejorative – to be all things to all people. There isn't much, from mountain biking to a day's shooting, that the hotel can't organise for guests. Depa, "the world's largest interior contractor" (it worked on the Savoy and Dubai's Burj Khalifa), styled the hotel, which, like the Raithwaite Rolls-Royce parked outside, conforms to a wealthy, middle-aged idea of contemporary good taste. The restaurant's glass-walled wine store, itself a big-city cliche, is as edgy as it gets. That said, while there were details in my entry-level bedroom (mustard carpet; gilt-frames; antique-style furniture) that weren't to my taste, it is spacious and very well-equipped. It was clearly conceived by somebody with an astute grasp of what guests value in a hotel bedroom. The bed is huge and luxuriously comfortable, with high-quality linens. The heating is easily adjusted, the Wi-Fi/TV idiot-proof. There is a well-stocked tea tray, fruit bowl, iron, hairdryer and iPod dock, plus a balcony that overlooks Raithwaite's manicured gardens. In the bathroom, there are Molton Brown toiletries and a handsome Villeroy & Boch suite. Being a bar rather than spa man (people pad the corridors in bath robes, like it's a sanatorium), I head to the lounge, where, as Sinatra croons over the PA, Raithwaite's well-drilled staff pamper guests, without getting too obsequious. Everyone knows your name, Mr Naylor. Which is a little disconcerting, Mr Naylor. But the staff are personable, natural, at ease. The restaurant majors, unadventurously, on steaks, from Yorkshire-bred Limousin cattle. My 300g 45-day aged rib-eye, mapped with fat and grilled, bone-in, over wood, to a precise medium rare, is sensational. It should be for £28. The chips, however, are slightly underdone and a pork belly and black pudding fritter starter is OK, but needs streamlining, refining. The elaborate breakfast (there's chorizo, smoked salmon, all sorts) is a self-service buffet, sadly. Why buy high-quality local sausages then leave them hanging around in a warmer? After breakfast, I follow a path through woodland towards Sandsend, pheasants fleeing as I approach. It's a magical little route that gives way to great sea views. If you want to treat your dad for his 60th, take him to Raithwaite. He'll love it. If a friend's getting married here, stay. You'll enjoy it. But will it set your pulse racing? Probably not.